The heat suddenly isn’t working properly, so it’s currently 52 degrees in this house and dropping. I complained a few posts back about it being chilly outside, but this! This has got me worrying that the otherwise nice week I’ve been having is going to take a drastic turn toward dumpster fire status. You know that feeling when something small goes wrong and you’re like, “Oh no, this is going to wind up a hot mess, isn’t it?” Yup, that feeling is creeping in. Notice the fact that I keep tossing out words like “hot” and “fire” as if they’re a bad thing. Did I mention the fact that I’m shivering? 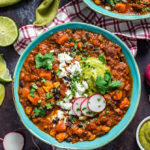 On the bright side (see, I can be optimistic), in a far-off land beneath a mountain of blankets, I’ve been daydreaming about warm, comforting dinners like chili. And you know what I realized? 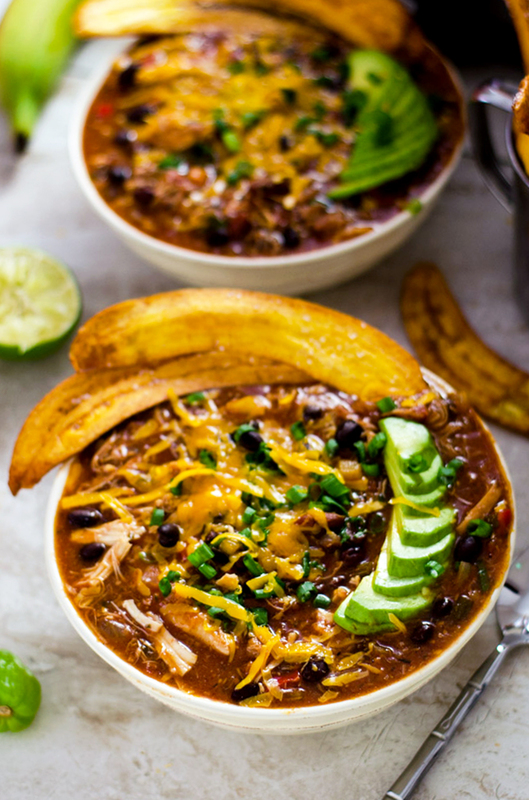 That I completely forgot to tell you guys about this Slow Cooker Jamaican Jerk Chicken Chili with Plantain Chips, which I made and devoured weeks ago. For shame, I know. Especially because this chili is waaaay up there on the list of the best things to ever come out of my slow cooker. I’m going to try to keep this somewhat brief because 1) I’ve got to go try and figure out this whole heat situation before my fingers freeze and fall off, and 2) you’ve got important things to do too, like getting started on this chili ASAP. And trust me, if you like flavor-packed, healthy, set-it-and-forget it types of dinners, you want to get on that second part. 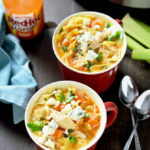 Now, don’t let a quick glance at the ingredients fool you– although the list is slightly long, this recipe is actually very simple. 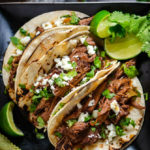 The only reason there appears to be a lot going on is that this recipe is loaded up with spices to give it an authentic Jamaican Jerk flavor. And let’s be real: it’s chili! You can’t have truly good chili without digging deep into your spice cabinet. 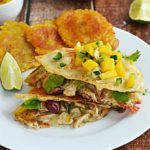 Sure, the dish definitely gets some of its Caribbean vibes from the combination of chicken, onions (both green and white, of course), garlic, bell pepper, habanero pepper, tomato, and beans (both kidney and black, we’re going no holds barred here). But the bulk of that spicy, islandy taste? Oh, it comes once we start seasoning, and it comes in strong. To begin, I use some bottled Jamaican marinade in the base. It might seem like cheating, but it’s the best way to get a jump start on the intricate mix of ingredients typical in Jamaican Jerk recipes without having to scour the grocery store for hours. Crushed tomato dilutes that marinade, though, so we can’t rely on just that to take us to the tropics. We’ve got to up our flavor game, big time. I add some soy sauce to boost the savoriness, brown sugar for sweetness, and then I stir in salt, thyme, cumin, allspice, black pepper, and cinnamon. Some of that might sound strange —really, cinnamon?– but the warm, earthy spices are critical for giving the chili depth and supplying that powerful Jamaican Jerk flavor without relying too much on the hot peppers. We want this recipe to have a kick, but still be edible for the whole family. Once I’ve got all of the ingredients combined, I place the lid on my slow cooker and try to be productive for the next several hours while the scent of all of those spices fills my house. It’s hard not to just stand by the slow cooker, sniff, and salivate for hours on end, but I valiantly resist the urge. Well, kind of. To keep myself occupied, I make plantain chips to serve with the chili. 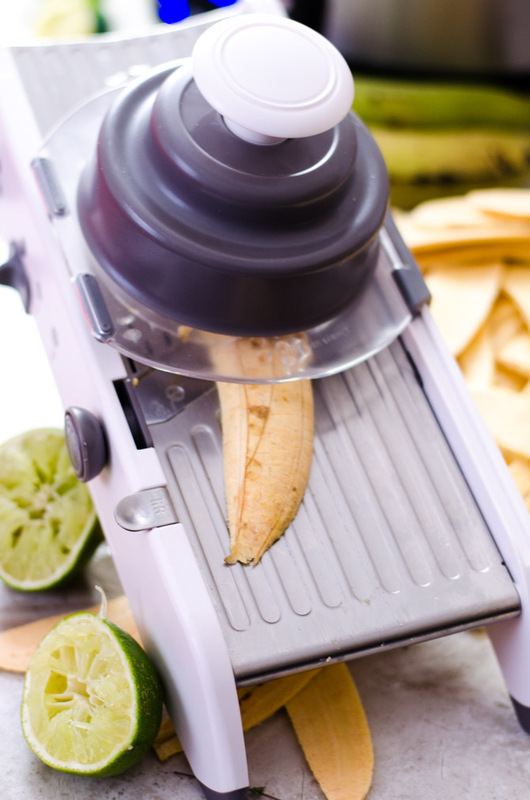 All I do is peel some green plantains, use my mandoline to thinly slice it them, fry them until crisp and golden, and then sprinkle them with salt. It just so happens that this all goes on in the kitchen, where I can bask in those lovely Jamaican Jerk aromas. That’s my kind of loophole. 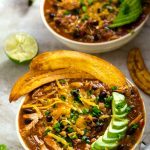 Before you say it, I know that the idea of healthy chili + fried chips seems to be at odds, but the plantains make that crunch factor well worth the little side-splurge. You know, as long as you can stop yourself from eating the whole plate of them before the chili is ready. Speaking of which, I brought plantain chips along with the Slow Cooker Jamaican Jerk Chicken Chili, the Sweet & Sticky Caribbean Shrimp, the Cheesy Pineapple-Habanero Bacon Dip, and the Rum-Caramelized Banana Berry Nut Crumble to my family’s not-quite-Thanksgiving dinner. Would you guess what the first thing to go was, out of that whole spread? Yup, it was the chips. Nobody could resist the plantain chips. 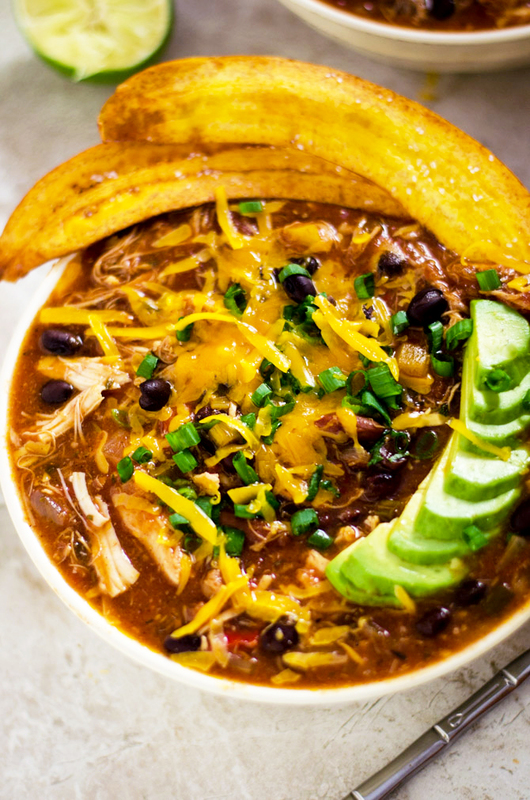 Don’t get me wrong though, the Slow Cooker Jamaican Jerk Chicken Chili was practically inhaled, too. My grandparents, who had already filled up on appetizers, each took 2 huge bowlfuls. They also laughed at me for worrying that it was too spicy for them. “It’s the good kind of spicy,” said Grandma Sandy, who had never before uttered the words “good” and “spicy” in the same sentence. This is the same woman who told me not to put black pepper in a dish last year because it would be too spicy. And just in case you forgot, this chili has minced habanero pepper in it. And it definitely packs some heat. Clearly the only logical conclusion is that this chili makes miracles happen. You heard it here first. But I’m all over the place with my train of thought– I haven’t told you what to do once the slow cooking is finished! Well, honestly, there’s not much. Just shred the chicken (which should be falling apart at the gentlest touch by that point), mix in the lime juice and cilantro, and serve. Yup, that’s it. 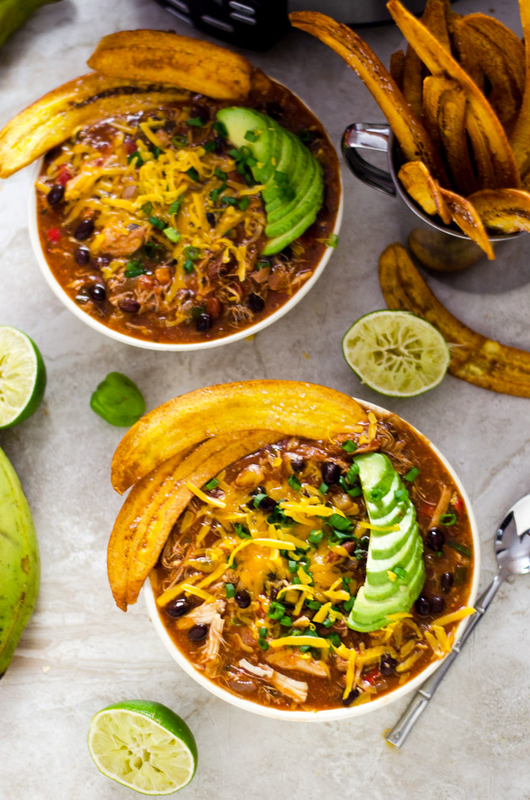 I like to serve my Slow Cooker Jamaican Jerk Chicken Chili with Plantain Chips with extra green onion, shredded cheddar cheese, and sliced avocado on top, but you can just serve it as-is if you’d prefer, or get creative with it. No matter how you dish it out, your family is going to love this chili. It’ll keep you all toasty through these cold winter months. Speaking of which, I need to get moving on that heat issue. So much for keeping this post short right? 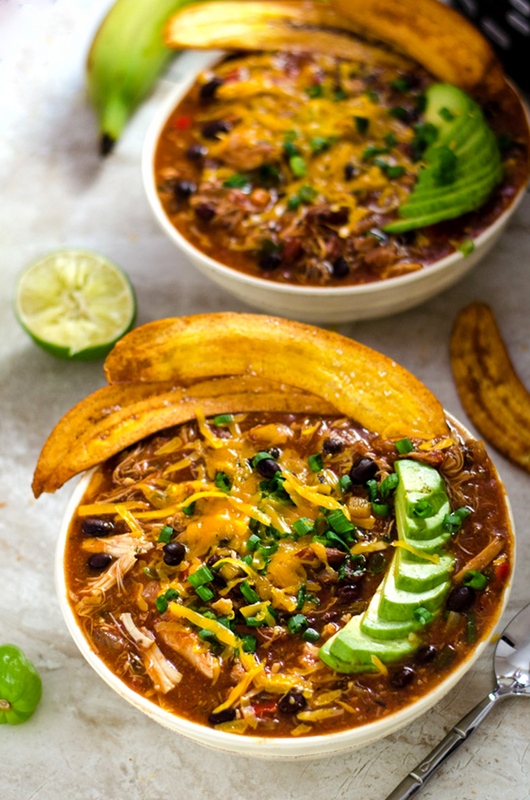 But there’s just one last thing before I go: Don’t forget to take a picture of your chili and plantain chips and post it to Instagram with the tag #hostthetoast! It’ll make me feel all warm and fuzzy inside (most importantly, WARM) to see your pictures of this delicious dinner. Do I cook or brown the chicken in some way BEFORE it goes in the slow cooker or does it just go in RAW??? I want to try this recipe because I love anything jerk (describes my taste in men LOL) but I’m a beginner and it’s pretty intimidating! Do you have any simple and easy recommendations for beginners like me? 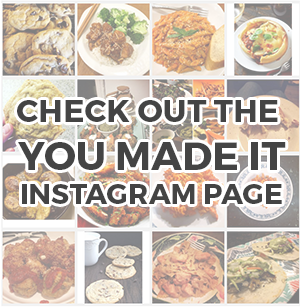 I’ve printed a handful of recipes from your site that I plan on trying (with help, of course), but I’d like something a little easier that I can do by myself. Trying to build my confidence in the kitchen. Thank you! Brandy, I’m a beginner as well. Skip the plantain chips, and this is a cinch to make. Seriously, and it was so good! 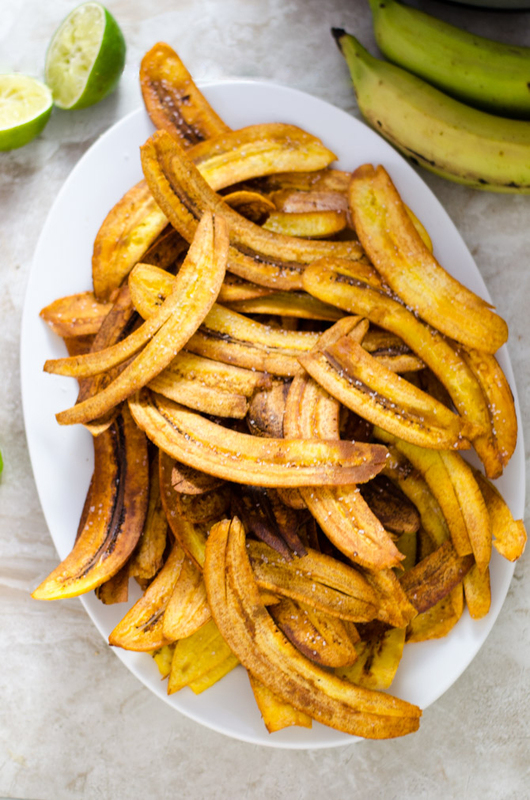 However, if you skip the plantain chips, you’re also skipping some of the fun and deliciousness. They’re not that hard either. So try it! what brand is the jerk marinade that you use? I used the generic store brand jerk marinade this time. My favorite jerk marinade is Walkerswood, though. If you do use it, make sure you use mild to medium, and adjust the amount of habanero you add, if necessary. The marinade that I used was relatively mild. Hi Morgan – I looked on Walkerswood website – I don’t see any product explicitly called “Jerk Marinade” that’s also labelled Medium or Mild. They only have one Marinade – and it’s labelled “Spicy” They do have a “Mild” product: Jerk Seasoning – which appears to be a dry spice blend. Is this what you’re talking about? Do you know of any alternative marinade products that are mild or medium? Or do you have a recipe to make a mild/medium jerk marinade? Thanks! Do you add the habanero whole? Or do you slice/dice/chop it? Do you drain and rinse beans before adding? I didn’t when I made mine, and it resulted in a fairly soupy chili. (It did set up a bit after refrigeration, though.) But that works for me ’cause I’m serving it over rice. I don’t know if that’s how it’s supposed to be. That might water down the flavor. Also, not draining the beans resulted in a full (1 gallon) slow cooker. It almost didn’t fit, was hard to stir, and bubbled up onto the lid and rim in a few places. Since I still have a bunch of marinade left and am not clever enough to use it without a recipe telling me what to do, I might make this again with drained and rinsed beans to see how the options differ. I hope that helps! This was awesome! 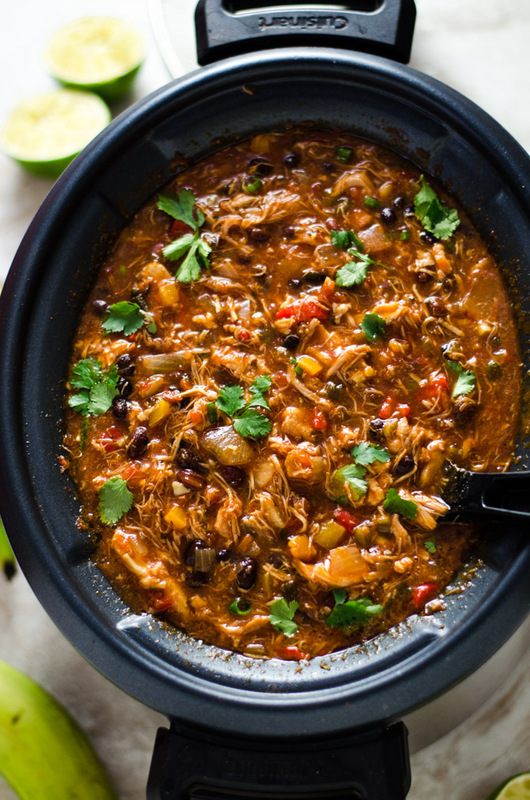 Like you said, one of the best things we’ve ever made in our slow cooker, not that we’ve made a lot. I made it a couple of weeks ago, and I’m making it again for my Poker Night this weekend. Great recipe. Thank you so much Tom. I’m so happy to hear that you liked it so much! Just made this. Its gotta be the hottest thing ive ever eaten in my life!!!! Think i may have to chuck the remaining 7 portions!!!! Very disappointed! I’m sorry to hear that, Lisa. What kind of jamaican jerk marinade did you use? I tried to make it clear in the notes for the recipe that it’s important to adjust for the heat of your marinade but I will add “mild” to the ingredients list to make that clearer. Before throwing anything out, you might want to add some cream to neutralize the heat. It will change the recipe a lot, for sure, but it will still be tasty and of course would be better than wasting! I made this last night as meal prep for the week and it was amazing! Spicy, but not too spicy. Just a note – the amount of Allspice in this seemed really extreme, so I only used a tiny bit (it’s not one of my favorite flavors), but other than that I followed the chili recipe exactly and it was delicious. I’m actually looking forward to eating it all week. For anyone tracking calories/macros, this is also very healthy. I came up with 390 calories, 41g carbs, 6g fat, 41g protein, 10g fiber (not including plantain chips). Oh yeah, and my store actually had plantain chips so I just bought those instead of making them myself. I’m lazy like that – lol. Hi Morgan – I have a couple of questions regarding the jerk marinade that you refer to in the recipe and one of the other comments. Could I use the recipe for the marinade you have provided in your Jerk Pork chops recipe? The brand that you mentioned you like (Walkerswood) doesn’t have a “mild” product that’s also called “Jerk Marinade”. The only marinade product they have is listed as “Spicy”. They do have a “mild” jerk seasoning – but that looks more like a spice blend than a marinade. I also found a recipe on America’s Test Kitchen website for Jerk Chicken – and their marinade is very paste-like consistency. Not sure if that’s what you’re suggesting for this chili recipe. Looking forward to trying the chili recipe – just want to make sure I’m doing as close an approximation of your version as possible. Thanks! So many recipes I find on pinterest are duds, but this one was awesome! Hits the spot when your craving some spicy jerk chicken, even if you aren’t a fan of chili (which I am not). But this ones a keeper! Thank you!! Made it tonight and my house smells amazing!! Can’t wait for my husband to try it! I doubled up on the recipe so when it came time to put it in my crock pot it was way too much so I had to end up taking a few pieces of chicken out and cooking it on the stove, still came out amazing!!! the recipe did create a lot of liquid in my Crock-Pot but 4 hours in drain the liquid, save the drippings so that I can add to my liking. definitely going in the recipe book!! What size crockpot! I need to double it for a pot luck but don’t want to overshoot my crockpot’s abilities. Did you keep the bean liquid or drain and rinse them? Thank you! This turned out fantastic! So nice to come home to after a day of snowshoeing in the cold. The chicken was perfect after cooking on low for about 8 hours. I couldn’t find Jamaican jerk marinade but did find a jar of Grace brand “hot Jamaican jerk seasoning” which resembles a curry paste. It was quite strongly flavoured, so I used about 1/4 to 1/3 of a cup instead of the cup of marinade called for in the recipe. Quite a nice recipe. The only thing that kept me from giving 5 stars was I thought it came out being way too sour. I’ll have to try just one lime next time but even that may be pushing it. I used Walkerswood Spicy Jerk Marinade and added one habanero. I thought it could use at least two more but my family said it was borderline too hot for them so I surrendered. Will definitely make again. Fantastic served over a mix of brown and black rice! The cinnamon adds (to me) a very exotic quality that continuously surprises me. Reminds me of some of the Moroccan stuff I’ve made. Since the recipe didn’t specify, I did not drain or rinse my beans. This resulted in my 1 gallon slow cooker being full to the brim! The chili was very soupy, but that made it perfect for topping rice. It froze well, though the liquidy part turned from a saucy texture to a watery one. I had a hard time finding Jamaican jerk marinade, but the Caribbean jerk marinade I saw is apparently the same thing. Thought I’d mention that for anyone else in that situation. The one habanero I used seemed to me to add little heat, but maybe all that bean juice watered it down. I did not make the chips, as they looked like too much work for too little result. I’m curious how this would turn out with drained and rinsed beans! Absolutely amazing! Made this tonight and I thought my wife and I were going to lick our bowls. I made no changes. Is there a way to adjust for instant Pot? Would you suggest using walkerswood jerk seasoning? Tried this for a chili cookout and won first place. I subbed the habanero for our homemade pickled jalapeños (about 1/3 to 1/2 cup chopped) and threw in 1 lb. of bacon. It was amazing! I also put in jerk bbq sauce instead of marinade (480 ml). One person tried it that doesn’t even like chili and said it was amazing! We will definitely be making this again!